January 18, 2004, Palm Beach Post, An American in Mecca, by C.B. Hanif. On a desert plain in southwest Saudi Arabia, more than 3 million people soon will be in the midst of the hajj, an awe-inspiring sojourn to the places where the prophets Abraham and Mohammed prayed. The hajj is an age-old experience that exceeds one’s ability to fully comprehend it, yet whose lessons continue to unfold. It is considered the journey of a lifetime yet is one I would love to make again and again. Around Jan. 30, amid some of the starkest scenery this side of National Geographic, will come the high point of one of the largest annual gatherings of people on the planet, as Muslim pilgrims descend on the plain of Arafat for nothing less than a day of communion with their Creator. Three years ago (in 2001), I was in that wilderness, among that vast throng of people. And while it is impossible to articulate all its sentiments, I can share some of the rites, the rigors, the rewards of the hajj. The most overwhelming physical feature of this ancient pilgrimage – aside from the desert and volcanic-mountain setting – is the awesome sea of people of almost every imaginable nationality, ethnicity, language and dress. It is a bouquet of humanity responding to an invitation from God – Allah in Arabic – to visit a part of the Earth long considered sacred; where, according to tradition, Adam and Eve worshiped. Like any pilgrimage, the hajj is a spiritual journey. The sojourn is rendered more tangible, however, by the exquisite marble architecture of Al-Haram, the Sacred Mosque in Mecca, the world’s largest open-air mosque, and by the presence in the mosque’s great courtyard of the black-robed Kaaba – the “House of God” (Bait ul Allah or biblical Beth-El). Built by Abraham and his son Ishmael, it signifies, among other things, each human being’s relationship with his or her Creator, and unifies Muslims around the world with a common direction for the trademark five daily prayers in Islam. People pray at this ancient site 24 hours a day, 365 days a year. But only during the hajj are so many people present, and all are trying to perform the same rites in the same space at the same time. “Hurry up and be patient” is how the challenge was characterized by one of our group leaders, Imam Salahuddin Hanif of Albany, Ga.
Our group of students of W.D. Mohammed, the eminent American imam, flew from the U.S. via Frankfurt, Germany, to King Abdul Aziz Airport in Jidda,Saudi Arabia. There our hajj delegation swelled to hundreds. We would be gone three weeks, and while providing for the maintenance of our families while away, we also had had to prepare as if we might not return: preparing wills, paying debts, squaring differences with other people. Most mosques offer classes to help prepare for the hajj, such as the one at our Muslim Community of Palm Beach County mosque where I was reminded the hajj is not a vacation or a pleasure trip. Many friends had made what is a traditional request, but I was touched by the number of non-Muslims, too, who had asked me to pray for them while in the Holy City. More folks travel to Saudi Arabia for the hajj than any other place on the earth, and most fly through the airport built for them in the desert at Jidda. Coordinating the massive influx of up to 400 flights an hour is a gargantuan task. We arrived in Jidda at 2:40 a.m. – 6:40 p.m. the previous night back home. In the afternoon we were aboard a Saudi Airlines jet, with a pilot’s apology for the delay due to “poor 1,000-meter visibility with blowing sand and 23 degrees Celsius, also a lot of hajj traffic including to Medina.” We were headed first for that city which most try to visit before or after the hajj in and around Mecca. Soon we were flying over dry terrain reminiscent of the American southwest, territory that camel caravans of hajjis negotiated with much less ease in centuries past. “We believe in God and the revelation given to us and to Abraham, Ishmael, Isaac, Jacob, and the Tribes, and that given to Moses and Jesus, and that given to all Prophets from their Lord. We make no difference between one and another of them, and we bow to God in Islam” – an Arabic word signifying surrender to the peace from God (Holy Quran 2:136). The revelations to the prophet assembled in the Quran (sometimes spelled Koran) were received in both Mecca and Medina over a 22-year period. 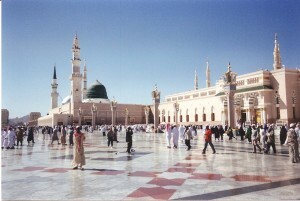 But it is in Medina that he is buried, under the green-colored dome of the mosque he built. The “Prophet’s Mosque” has since been enlarged to hold more than a quarter-million worshippers. A million can pray in the complex which includes the cool, marble-floored surrounding courtyard. Outside, escalators whisked pilgrims below ground to what seemed like acres of restrooms and wudhu stations for the ablution that precedes prayer. Even down there, floor to ceiling was marble and kept as immaculate as the ritziest restroom. Inside the vast, exquisite mosque, I was never able to see from one end to the other. Beautiful rugs cover almost every inch of floor. 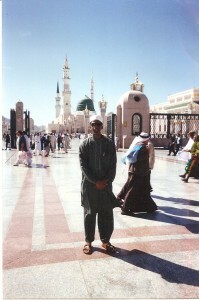 For hours each day, like countless other hajjis, I prayed, reflected, slept or soaked in the unparalleled atmosphere. Many devotees were brought to tears in the original portion of the mosque and at the prophet’s tomb nearby. During our stay we visited historic sites such as the serene Quba Mosque, which Prophet Muhammad also frequented for prayer. On our last day, after the pre-dawn fajr prayer, I joined the hundreds of thousands who squeezed past the prophet’s tomb to pay respects, and did the same at the Baqi Cemetery, where many of his companions and family members are buried. Back at our hotel, I began preparing for the bus ride to Mecca with my closet hajj companions, Mukhtar Muhammad and Robert Abdul-Wali Muhammad of Jacksonville, and Bilal Habibullah of Clearwater. We had the bath, prayer and other rites associated with donning the ihram – the two-piece, seamless white cotton garment for men, and simple white dresses and scarves, but no veil, for women. A great equalizer, the clothing symbolizes purity, unity and a separation from mundane matters. It takes some getting used to seeing others, much less presenting one’s self, in such simple dress. A few hours later we pulled into a huge parking lot sporting the sign, “Ministry of Pilgrims/Pilgrims Arrival and Departure Center,” where our passports and visas were checked. There were hundreds of buses of similarly clad pilgrims, who all must be in ihram when we pass the miqat or boundary of the holy precincts of Mecca to which we were headed. It was in the middle of the night when we arrived at Al Ibrahim – the Abraham – hotel, exhausted after the long bus ride but eager for the joys of Umra. Umra, the short pilgrimage, may be performed at any time of the year, which explains the 24/7, 365 days a year of prayer at the Kaaba. Umra should not be confused with the hajj, which officially begins on the eighth day of thul-hijjah – literally, the month of hajj, the twelfth month of the Islamic calendar. Ramadan, the month of fasting, is the ninth month of the calendar, which is based on the cycles of the moon and moves forward in the Western calendar about 11 days a year. The rites of Umra are the pilgrim’s first obligation in Mecca. They include making the seven circuits, called tawaf, around the Kaaba, which was established by Abraham and his son Ishmael as the first house dedicated to the worship of God; prayer at the nearby Station of Abraham; drinking from the Zamzam spring; and Sa’i, the ritual jog between two nearby hills, Safah and Marwah, about 400 yards apart. The Sa’i retraces the anxious search of Abraham’s Ethiopian wife, Hagar, for water for her son Ishmael before the spring gushed at his feet, making Mecca a desert destination. The Umra rituals take place at the Great Mosque in Mecca, which invokes awe upon first, long-awaited sight. “Its coliseum-size walls and bright, moon-rocket minarets tower above the streets from blocks away,” is how the exquisite marble temple has been described by Muslim scholar Michael Wolfe, editor of One Thousand Roads to Mecca, an outstanding anthology of centuries of hajj travelogues. Soon we joined the human ring moving counterclockwise at a stately pace in a walking prayer around the simple black-draped Kaaba at the center of the mosque reciting the talbiyah, parts of which are translated as, “Here I am, O God, at Thy Command! Thine are praise and grace and dominion! Thou art without associate.” In the massive mix of people, it is easy to see why God wants human beings to witness this testimony to the oneness of humanity. On subsequent days when I returned to make tawaf while awaiting the start of the hajj, there were hundreds of thousands more people with the same objective to reach the legendary black stone, imbedded in a corner of the Kaaba, which the prophet had kissed. Arriving around 4 a.m. one morning, I found that so many others also had arrived early for fajr that the closest I could get was several hundred yards from the mosque. As other pilgrims dispersed that day, I worked my way inside for tawaf, then tried to explore every inch of the vast complex that can accommodate a million people. I eventually found my way to the top level, the third not including the basement. Up there at the railing became my favorite place in Mecca outside of being in the tawaf. Beneath sun or stars I could pray, read Quran, remember loved ones and friends, talk with other hajjis. As I gazed down at the circular procession around the Kaaba that stopped only at prayer time and resumed immediately after, I marveled that God had blessed me to accept His invitation. I was beginning to learn there is the hajj, and there is your hajj, and your hajj is like no one else’s; it literally is between you and God. Every hajji, or hajja for women, has innumerable stories. Among my favorites is hearing a familiar voice call my name in the hotel lobby and turning around to embrace my cousin, Norman Jackson, whom I had not seen in nearly 25 years. He and his wife Ruth also were in our group. Like many others I also contracted the “hajji virus” which lingered even after I was back home. By then I had lost around 15 pounds from the vicious flu and suspected that a salad I unwisely had eaten in Mecca had come back to bite me. It was just another of the trials during the hajj that help us learn sabr – patience. Later I was glad Allah had blessed me to endure a hardship similar to that of so many of His Guests, a reminder of the past and present suffering of people of all faiths. The collective hajj officially began a couple of days later with the mass exodus of the entire body of pilgrims a few miles to the valley of Mina, a vast plain midway between Mecca and Arafat, where a tent city stretching farther than the eye can see became our temporary homes. “We made you into nations and tribes,” God says in the Quran, “that you may know one another, not that you may despise one another.” Back in the ihram that many of us had taken off after Umra, we have been brought to a place where there is little else beyond better knowing the Almighty, each other, ourselves. The height of the hajj comes the next day, the ninth of Thul-Hijja, when the pilgrims spend an entire day conversing with God on the desert plain of Arafat, about 12 miles from Mecca. Muslims believe any prayer offered in this place at this time – considered by some scholars a preview of the Day of Judgment – is granted, just as a hajj that is accepted by God wipes clean their slate of sins. That wonderful, blisteringly hot day ended for us with an extremely rare Arafat storm that was strong enough to topple some tents. First came the wind, then light rain. The fading daylight and energy in the air made for an amazingly electric atmosphere. I sat and soaked it in even as my spirit already seemed to be overflowing. The Pilgrims spend that night under the stars at Muzdalifah, a few miles north of Arafat. Campfires and flashlights as far as my eye could see made for one of the most magical of sights. The 10th day, Eid al Adha, is celebrated around the world marking the success of the hajj. Like Eid al Fitr, which marks the end of the fasting month of Ramadan, Eid al Adha moves forward about 11 days each year in the Western calendar. Eid al Adha also commemorates Abraham’s and his son Ishmael’s willingness to obey God’s command that Ishmael be sacrificed – only to be told that God wants not blood but our willing obedience. The pilgrims honor that surrender by arranging for the sacrifice of a sheep, goat, camel, etc., on our behalf, with most of the meat going to the poor. Some of us performed the sacrifice ourselves. We also trim or shave our hair, and perform another tawaf and Sa’i. On the way to our hotel, with the pebbles we had gathered at Muzdalifah, we performed the first of several symbolic stonings of concrete pillars representing the places at which Abraham rejected the devil’s temptations of Satan. The pillars on the road from Mina are at the center of giant ramps built to accommodate the huge crowds; the seven pebbles thrown at each pillar signify the rejection of Satan from each level of our consciousness, as well as the spiritual baggage we have tossed away. Only at the hotel do we learn from worried family and friends at home that at least 35 hajjis had been killed in the crush of people during the stoning. Those who die during the hajj, Muslims believe, go to heaven. Such tragedies also suggest that while on earth we must do a better job of wanting for our brothers and sisters what we want for ourselves, the message in the Golden Rule. In our own cultural clothing again, relieved of burdens on that plain where poor and rich, white and black, old and young met on equal footing, we return to Mina for two more days of reflection. For the sincere Muslim, the hajj is preparation for living the life of hajj. I had begun to learn that in the way we treat each other in the holy precincts, there are lessons for us after we have left. A blueprint for developing the soul, the hajj impresses upon one’s consciousness the universality of God and the dignity of each human being He created. One effect should be that we return with more tolerance for others, including those who look, sound, act and think differently than us; that we better understand the conditions other people are experiencing; that we are more grateful to God and more useful to our communities so we all can better live in the world. Finally, it was time for our farewell tawaf, a wonderful last visit to the Sacred House that we might not see again. This is where the prophet eventually returned from Medina to cleanse the Kaaba of idols and sanctify it as a sign of the worship of God. Here he granted amnesty to those who because of his sincere faith had persecuted him all the way to Medina. He died not long after delivering that last sermon, but had commemorated Abraham as the father of faith by establishing the rites still practiced 14 centuries later. Wali and I arrived at the Sacred Mosque around midnight, happily joining the flow of the crowd already noticeably lightened by the departure of many hajjis from the city. The Kaaba was resplendent in its magnificent new covering, or kiswa, which is replaced each year while the pilgrims are at Arafat. We offered last prayers at the Station of Abraham, a glass-encased stone that contains his footprints and also is symbolic of the state of consciousness – complete obedience to God – that made him a model for humanity. We drank from the healing Zamzam spring – now a pumping station with faucets at hundreds of basins – that miraculously has flowed ceaselessly since it first did for Hagar, herself a monument of patience under the hardest trials while seeking for a sign from God. Then with my hand on Wali’s shoulder as he forged our way through the crowd, we left, with me taking repeated last looks at the Kaaba, and beginning to reflect on the memories and lessons I have been replaying over and over again. CAPTION: 1. (C) STAFF GRAPHIC. Location of Jidda, Medina and Mecca, Saudi Arabia. 2. (C) AMR NABIL/Associated Press file photo. EVENING PRAYERS: Many thousands of Muslim pilgrims pray around the Kaaba, the black cube seen at upper right, inside the Grand Mosque, Islam’s holiest shrine, in Mecca, Saudi Arabia, in 2001. 3. (C) Before the Hajj – C.B. Hanif with a camel. 4. (B&W) AMEL EMRIC/The Associated Press. CONVERSING WITH GOD: Muslims gather at the holy Mount of Mercy at Arafat, Saudi Arabia, near the white obelisk where they say prayers during the hajj. The time spent at Mount Arafat is believed to symbolize Judgment Day, when every person will stand before God and answer for his deeds. 5. (B&W) Photo by CHARMAGYNE AKRAM. UNITED: The women in our group in Ihram at Arafat wore yellow patches to help keep them from getting lost in the crowd. Hanif’s wife, Aneesha, is in the center, facing the camera. 6. (B&W) FAMILY REUNION: C.B. 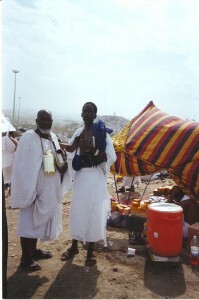 Hanif (right) with his cousin, Norman Jackson, whom he had not seen in nearly 25 years, at Arafat. Jackson and his wife, Ruth, were part of the group. 7. (B&W) Photos by C.B. HANIF. 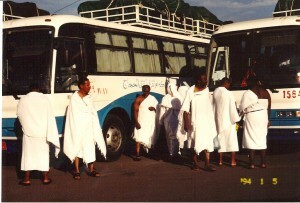 SACRED JOURNEY: Returning from Mina after Arafat, the beautiful Masjid Bin Bass and our hotel Ibrahim behind it. The road at left continues through a tunnel to the sacred mosque on the other side. 8. (B&W) AMEL EMRIC/The Associated Press. 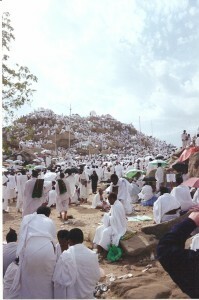 LAST VISIT: Pilgrims leave Mount Arafat after finishing the main ritual of their pilgrimage. On the way to Muzdalifa, they will collect pebbles to stone symbols of Satan. (I interrupt to note that I’m reprising here my Jan. 18, 2005 Palm Beach Post account of my 2001 Hajj, or pilgrimage to the ancient holy city Mecca. 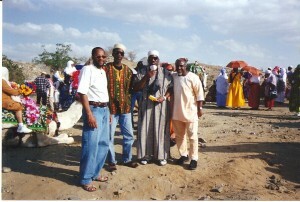 Touring the vicinity of Arafat in the days before the beginning of the Hajj (L-R): Imam Salahuddin Hanif of Albany, GA; C.B. Hanif; Mukhtar Muhammad of Jacksonville, FL; Bilal Habeebulah of Clearwater, FL. One reason: The piece received great response, for which I remain grateful, and still gets compliments. So I’d like to share it with friends of other traditions who often invite me to present a true perspective of Islam and Muslims. More important is to note that this year the main ritual of the pilgrimage — the day of prayer in the desert plain of Arafat outside Mecca, symbolic of when every person will stand before our Creator to answer for his or her deeds — coincides in the U.S. with our Thanksgiving Day. So Muslims’ Eid al-Adha holiday the next day, which in the U.S. increasingly is being shared with non-Muslim family and friends, is more than a great opportunity to share leftover turkey. The Hajj veterans’ inevitable reminiscences are as much a treat for those who long to make the pilgrimage as for the hajjis themselves. 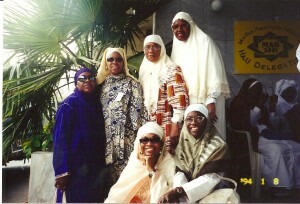 On the steps of our hotel in Mecca, ladies from our 2001 U.S. Hajj delegation. For more perspective on the Hajj, I can’t recommend highly enough the profound compendium of Hajj travelogues, One Thousand Roads to Mecca. Excellently edited by the noted Muslim journalist Michael Wolfe, this collection documents ten centuries of travelers writing about the journey that Islam prescribes at least once in their lifetime for Muslims who are physically and financially able to answer the Almighty’s call. From the medieval period, to the 19th century changes, to the Hajj’s jet age, the book’s 23 accounts include those of Naser-e Khosraw from Persia in 1050; the legendary traveler Ibn Battuta from Morocco in 1326; Sir Richard Burton from Great Britain in 1853, Winifred Stegar from Australia in 1927; Lady Evelyn Cobbold from Great Britain in 1933; El-Hajj Malik Shabazz — more popularly known as Malcolm X — from the U.S. in 1964; and Wolfe’s account of his own 1990 Hajj. …Around Jan. 30, amid some of the starkest scenery this side of National Geographic, will come the high point of one of the largest annual gatherings of people on the planet, as Muslim pilgrims descend on the plain of Arafat for nothing less than a day of communion with their Creator. The most overwhelming physical feature of this ancient pilgrimage — aside from the desert and volcanic-mountain setting — is the awesome sea of people of almost every imaginable nationality, ethnicity, language and dress. It is a bouquet of humanity responding to an invitation from God — Allah in Arabic — to visit a part of the Earth long considered sacred; where, according to tradition, Adam and Eve worshiped. Like any pilgrimage, the hajj is a spiritual journey. The sojourn is rendered more tangible, however, by the exquisite marble architecture of Al-Haram, the Sacred Mosque in Mecca, the world’s largest open-air mosque, and by the presence in the mosque’s great courtyard of the black-robed Kaaba — the “House of God” (Bait ul Allah or biblical Beth-El). Our group of students of W.D. Mohammed, the eminent American imam, flew from the U.S. via Frankfurt, Germany, to King Abdul Aziz Airport in Jidda, Saudi Arabia. There our hajj delegation swelled to hundreds. We would be gone three weeks, and while providing for the maintenance of our families while away, we also had had to prepare as if we might not return: preparing wills, paying debts, squaring differences with other people. More folks travel to Saudi Arabia for the hajj than any other place on the earth, and most fly through the airport built for them in the desert at Jidda. Coordinating the massive influx of up to 400 flights a dayan hour is a gargantuan task. Umra, the short pilgrimage, may be performed at any time of the year, which explains the 24/7, 365 days a year of prayer at the Kaaba. Umra should not be confused with the hajj, which officially begins on the eighth day of thul-hijjah — literally, the month of hajj, the twelfth month of the Islamic calendar. The height of the hajj comes the next day, the ninth of Thul-Hijja, when the pilgrims spend an entire day conversing with God on the desert plain of Arafat, about 12 miles from Mecca. Muslims believe any prayer offered in this place at this time — considered by some scholars a preview of the Day of Judgment — is granted, just as a hajj that is accepted by God wipes clean their slate of sins. Wali and me at Arafat, with the Mount of Mercy in the distance over my left shoulder. We offered last prayers at the Station of Abraham, a glass-encased stone that contains his footprints and also is symbolic of the state of consciousness — complete obedience to God — that made him a model for humanity. We drank from the healing Zamzam spring — now a pumping station with faucets at hundreds of basins — that miraculously has flowed ceaselessly since it first did for Hagar, herself a monument of patience under the hardest trials while seeking for a sign from God.